WHAT KEY ADVANTAGES SET REGAL HARDWOODS APART FROM COMPETING HARDWOOD FLOORING MANUFACTURERS? Regal Hardwoods will go above and beyond to ensure the highest standards in the industry. Three skilled craftsmen,each with a different tool, create a unique look by authentically hand scraping each plank. 7ft nominal random length boards create a less busy effect by spacing out the joints. We use only hardwood cores to prevent less denting, and better control of expansion and contraction. Since Regal is the manufacturer of our products, we are able to directly set and maintain extremely high quality standards for all of our products, and by being the manufacturer; we are able to skip traditional broker / distribution fees providing substantial savings to the dealer and end user without sacrificing quality. WHAT IS TITANIUM SCUFFGARD, AND WHAT ARE THE BENEFITS? Al2O3 (Aluminum Oxide) is the 2nd hardest element found on Earth next to diamonds. On the MOHs hardness scale, it is ranked at 9. That is impressive considering diamond is ranked at 10. This is why our Titanium ScuffGARD finish is 5 times more resistant than competing finishes. The aluminum oxide nanoparticles are UV cured with polyurethane. The nanotechnology also prevents a need to sacrifice the wood’s natural beauty because of the transparent nature of the finish, meaning there will not be a glaring plastic screen look on your floors after application. That is why our Titanium ScuffGARD finish is still the most effective finish in the industry. HOW DO I CARE FOR MY Titanium ScuffGARD FLOORs? Regal Hardwoods recommends that you use Pro-Care Citrus Cleaner for regular cleaning. It&apos;s extremely easy to use - just spray and mop. Pro-Care cleans and enhances the natural beauty of your floors and leaves a fresh citrus aroma with no sticky or oily residue. It can tackle even the toughest stains, but it is gentle enough for the most delicate floor finishes. Ask your local Regal dealer to purchase. If your local dealer does not stock it, it is also available on Amazon here. WHAT IS REGAL'S NATURE GARD FINISH, AND WHAT ARE THE BENEFITS? Our protective hard wax oil finish enhances the natural highlights of the wood’s colors. The oil seeps into the wood and brings out the inherent beauty and characteristics of the wood grain. To protect the surface, the tough protective wax coating creates a solid barrier that helps keep your floors beautiful through the years. In the event you do get a scrape or scratch, the hard wax oil finish allows for spot repairs. Since this is a natural product, this protective finish has low to no volatile organic compounds (VOCs). This finish is especially attractive to commercial settings, when wear patterns from foot traffic can be easily refurbished as part of an ongoing maintenance program with minimal disruption to the business. How Do I Care for my Nature GARD Oil Finish Floors? Mixing specifics/instructions are covered in the "Tips and Care" support document in the pdf download section. This product is also available in convenient Natural Soap Spray bottle (no mixing necessary). Oil Refresher should not be used more than four times per year as this may create unwanted build-up. HOW DO I INSTALL NATURE GARD FINISH FLOORS WITHOUT TAPE? WHY IS AUTHENTIC HAND-SCRAPED WOOD FLOORING SUPERIOR OVER MACHINE-SCRAPED FLOORING? HOW DO I KNOW IF YOUR PRODUCTS ARE TRULY 100% HANDCRAFTED? If you do not see repetitive patterns in your floor, then each of your boards were truly 100% hand-scraped. Please beware - although many competing products are advertised as hand-scraped, they are actually put through a machine-scrape manufacturing process that tries to replicate Regal products’ authenticity. The main reason behind this bait and switch is to reduce cost. We do not believe in undercutting our customers. Regal Hardwoods gladly honors our promise to produce unique products for our customers, so each plank of our wood is skillfully honed by our master craftsmen. Regal Hardwood’s truly authentic hand-scraped flooring products will bring a beautiful and rich look to your home that competing products cannot. WHICH IS A BETTER PRODUCT, A 3/8 INCH 7 PLY, OR A 1/2 INCH 5 PLY PRODUCT? When dealing with engineered hardwoods, the number of plies determines the stability of the product, not the overall thickness. Therefore, a 3/8 inch, 7-ply hardwood core would be more stable than a 1/2 inch, 5-ply hardwood core. ARE REGAL HARDWOODS PRODUCTS ECO-FRIENDLY? WHAT IS THE LACEY ACT? The Lacey Act is a conservation law in the United States that makes it unlawful to import, export, transport, sell, receive, acquire, or purchase in interstate or foreign commerce any plant, with some limited exceptions, taken in violation of the laws of a U.S. State, or any foreign law that protects plants. Regal Hardwoods incorporates sustainable forestry practices and never condones illegal logging. We require all our raw material suppliers to be Lacey Act compliant. SHOULD I CHOOSE A SITE-FINISHED FLOOR OR A PRE-FINISHED ALUMINUM OXIDE FLOOR? The only advantage to a site-finished floor is that you can customize your color, but with so many pre-finished options today, it is not necessary to go through the hassle of the sanding and finishing process. Site finished flooring typically uses 2 or 3 coats of polyurethane finish. Where they fall short is that they do not have nanotechnology engineered aluminum oxide in them. On average, site finished flooring will need recoating every 5 to 7 years, but our pre-finished floors are guaranteed for at least 50 years. Site finished flooring carries no warranties on finish or structure. Site finished flooring also requires extensive cleaning and touch-up from the sanding and staining process. Site finished floors also cure in an uncontrolled environment allowing for dust and trash to be trapped in the finish. We take all of the work away with superior prefinished products. WHAT'S THE DIFFERENCE BETWEEN A HARDWOOD CORE AND A SOFTWOOD CORE? A 7 ply Baltic Birch hardwood core is much more stable than softwood core. It is best for providing structural stability and preventing most expansion and contraction of the floor. Most manufactures use poplar, compressed fiber board, or other soft wood options to reduce cost & weight, allowing them to ship more due to freight restrictions. I'M INSTALLING REGAL HARDWOODS, DO I NEED TO ACCLIMATE MY FLOORING? Acclimation is not required to install our engineered hardwood floors. Prior to installation of engineered hardwoods the job site temperature and relative humidity levels MUST be carefully measured. The homeowner MUST maintain the recommended ranges (60° to 80° F & 35 to 50 Relative Humidity) to insure the best protection for the lifelong durability of your floor. Over the past decade there has been huge controversy over engineered vs. solid wood flooring. Engineered flooring was designed to be more dimensional stable than solid under certain conditions. Most manufacturers have found by maintaining proper relative humidity (typically between 35 to 55%) engineered flooring remains reasonably stable where solid flooring will see side affects like gapping. Engineered will also see side affects but at lesser amounts. If engineered flooring is exposed to high or low RH conditions one may see irreversible affects like checking, splitting, shear, delamination, dry cupping, etc. When environmental conditions go beyond the caution zone and into the guaranteed to fail zone these side effects will become permanent. Where solid wood flooring will see side affects as well but usually will just have larger gaps between the planks. 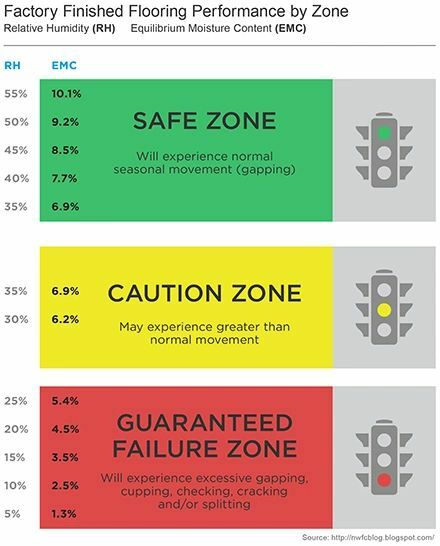 Listed below is a chart which helps outline some of the relative humidity boundaries by the flooring manufacturers. Please be sure to ask your retailer regarding proper relative humidity requirements and the possibility of the effects in the “Guaranteed to Fail” zone. If you live in a location where the relative humidity typically falls out of the Safe Zone, you might consider purchasing a meter for frequent checks. WHERE IS REGAL HARDWOODS LOCATED? Copyright 2019 Regal Hardwoods, All Rights Reserved.